Replaces male plug end of RV extension cords. Cable range: 10/4 to 4/4, 1.00" max cable O.D. Plug configuration: NEMA 14-30P or NEMA 14-50P (neutral blades for both configurations are included). Repair 50A extension cords to save cost of replacement. 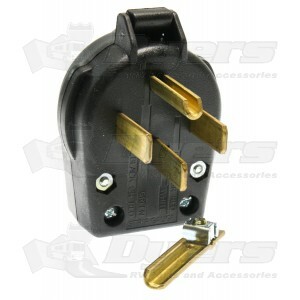 Also used as a 50A range or dryer replacement plug. Includes a blade to adapt to a 30A range or dryer cord. 3-7/8" H x 3" W x 1-3/8" Thick without prongs x 2-3/4" Thick with prongs.